Two summers ago, I had the pleasure of competing in the inaugural version of The Moosalamoo Ultra, and while I will not be running the full 36 mile version of it this year, I thought I would piece together a significantly shorter run which included at least a few segments from this far more grueling course. I also wanted to piece together bits of trails in such a way that I had never run that particular combination before, so I chose a route starting from the Falls of Lana trailhead, just south of Branbury State Park, ascending to the Goshen-Ripton Road on the North Branch Trail and the Voter Brook Overlook road, and descending on a mix of snowmobile trails and unmarked trails. It has not gone unnoticed by myself and others, that the frequency of bear sightings in the Moosalamoo area has been on the rise. Bear sightings on the trail are a true treat, as long as the bear chooses the appropriate response – that of running away. So, I have decided that the key to a good bear sighting is to run quietly, and wear garish clothing to scare the bear away once contact is made. 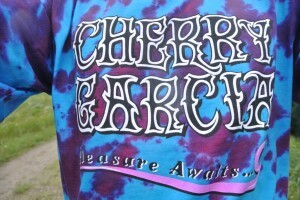 With this in mind, I purchased a brand new Ben and Jerry’s tie dye t-shirt – do you think this will scare away a startled bear? And yes, I looked into this idea, and bears are not colorblind, although I would not have wanted to be the person holding picture books with hidden numbers in front of hungry bears…. I set up the now routine climb on the Silver Lake service road, but instead of taking the heavily traveled sharp right hairpin turn at the half mile point, I went straight as if I was planning on ascending to the Rattlesnake Cliffs. After a few hundred yards on this trail, I came to the open meadow where the North Branch Trail bears (pun intended) right. This small sunny oasis in what is mostly a pretty heavily forested section was full of mid-summer wildflowers. 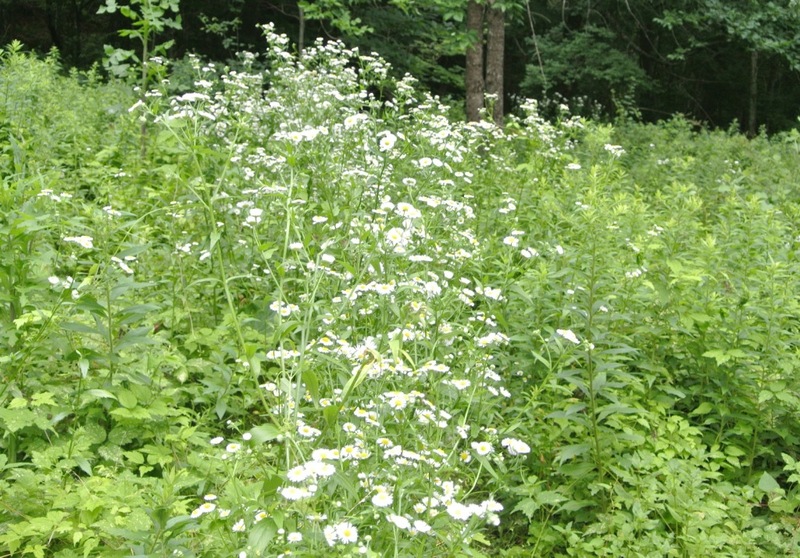 I was particularly fond of the small, daisy-like flowers which flanked the path on shoulder-height stalks. Does anyone know what this wildflower is called? At this point, my run joined a section of the route from the Moosalamoo Ultra. This trail junction is where the first feed station, reached after the early-race ascent and descent of Mt. Moosalamoo, around mile 8, and is the lowest altitude point of the race. From here, over the next two miles or so, there is a steady climb along the banks of the North Branch of the Sucker Brook, a rather attractive little stream. Most of this single-track trail has good footing, although there are a few sections with wet rocks necessitating some care in one’s footing, and a few short steep scrambly sections. 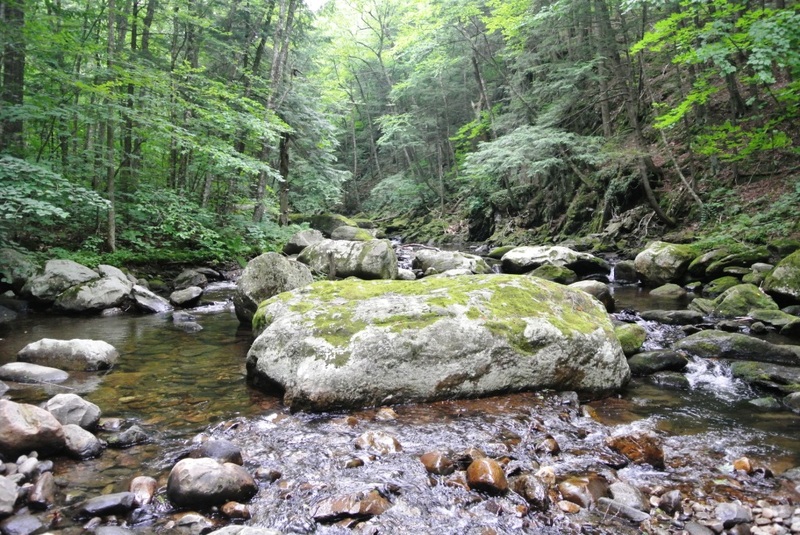 This trail passes by a few opportunities to get onto easier terrain, as it more or less parallels the rough road connecting the Goshen-Ripton Road to the Voter Brook Overlook. As the weather went from dreary to drizzly to pouring rain, I chose to remain in the relative shelter of the forest rather than the easier travel of the road. 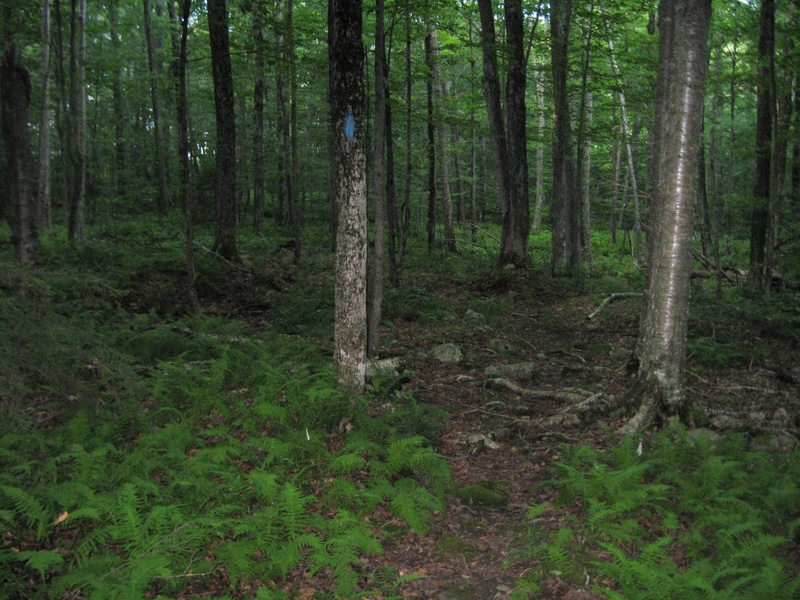 This section of the North Branch trail eventually does cross the dirt road, and continue through the woods until it reaches the Moosalamoo Campground, where one must finally continue to climb on the road to get to the Goshen Ripton Road. At this point, the Ultra crosses the road, for a long series of loops up and around the Sugar Hill Reservoir, but on my much shorter run I turned right on the road, and continued for a little over a mile until I came to a well marked snowmobile trail veering to the right. At this point, I rejoined the Ultra route, and this road crossing is the site of another feed station, at around the 21 mile point. The next two miles are pure running pleasure – gradually downhill, double track running, with only a few muddy patches. In fact, when I ran this section of the Ultra two summers ago, this stretch got me in trouble – I felt so good that I neglected to take in fluids, and paid dearly for my dehydration a few miles later! No such problem on this run today however, and the falling rain kept me quite cool. There are a few trail junctions where one should follow the signs for the snowmobile trail system, although some of the other trails crisscrossing my course look like they are worthy of exploration someday. After about two miles on the snowmobile trail, and a short, steep climb, the trail came to the service road connecting the small Sucker Brook Reservoir to the Silver Lake access road. In keeping with my plan to duplicate the Ultra trails, I took the sharp right descent, leading me to the “shores” of the Sucker Brook Reservoir. 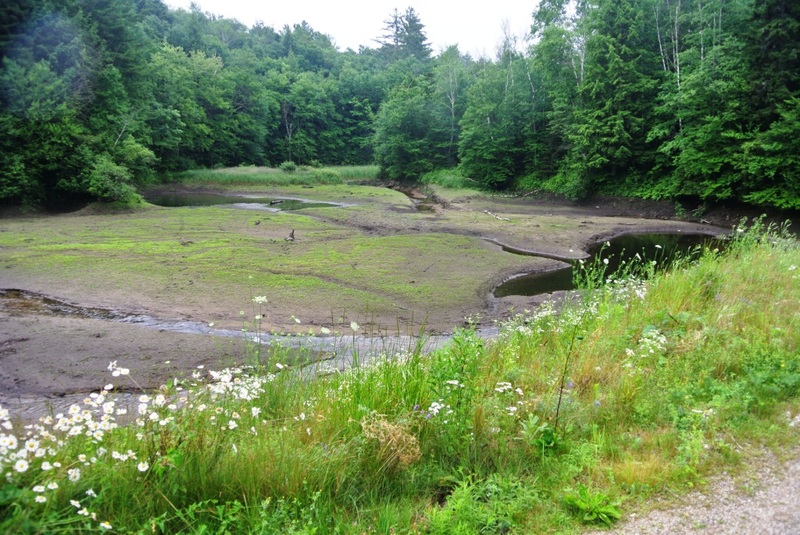 I put the word “shores” in with quotes, as it seems that there isn’t much water this summer in the reservoir, which exists for flood control, and to control the waterflow heading through the penstock down the the hydroelectric plant at Lake Dunmore. 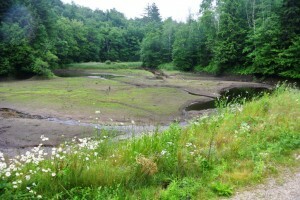 So, I am afraid this small lake is nothing more than a mudpit this summer. My run then followed the Ultra route, following the road below the earthen dam and joining the broad swath of clearing alongside the buried pipeline connecting the reservoir to Silver Lake. When I ran the Ultra, this section had been recently brush-hogged, making for easier running, but at this point, the grass here is very high, concealing some challenging footing below, on a steeply leaning embankment without an obvious path of least resistance to the runner. I have found that staying high, on the runner’s left makes for the easiest passage on a fairly challenging piece of running for the next mile or so. After a while, it flattens out, and while there seem to be a few different trails here, they all end up at the same place, connecting to the Silver Lake Access Road. When you reach the Silver Lake Beach, this is where another feed station is located at around mile 26 in the Ultra, and the race continues with the exhausting loop up over the Chandler Ridge and around Silver Lake before returning to the Blueberry Hill Inn and the finish line. At this point, I was very wet and had run enough, so simply descended on the service road to my car and the completion of the run. Now, I’ll bet my readers were guessing that there would be a bear sighting in this run. 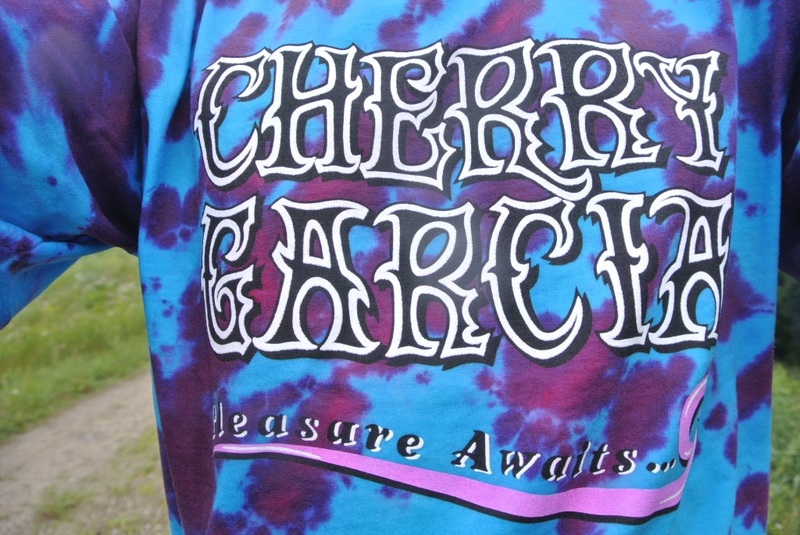 Sorry to disappoint you – I guess my t-shirt worked too well! 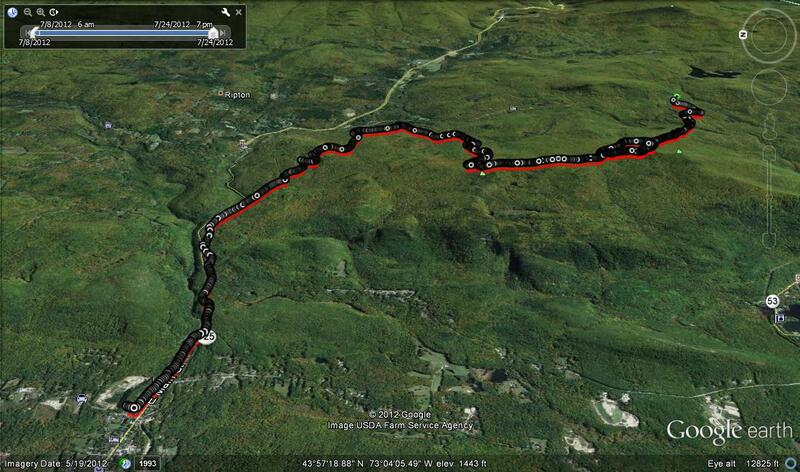 This ended up as a 9.5 mile run, with about a thousand feet of climbing. I also learned that my new t-shirt needed to be washed, as it had leached blue dye all over my torso! 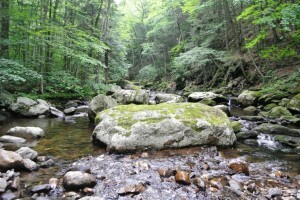 This entry was posted in Midd Blogosphere and tagged bear, Branbury State Park, Hill Climb, Lake Dunmore, Running, Silver Lake, Sucker Brook Reservoir on July 20, 2014 by Jeff. The title of this post, “Last Run Before Spring”, might have you scratching your head over chronology. 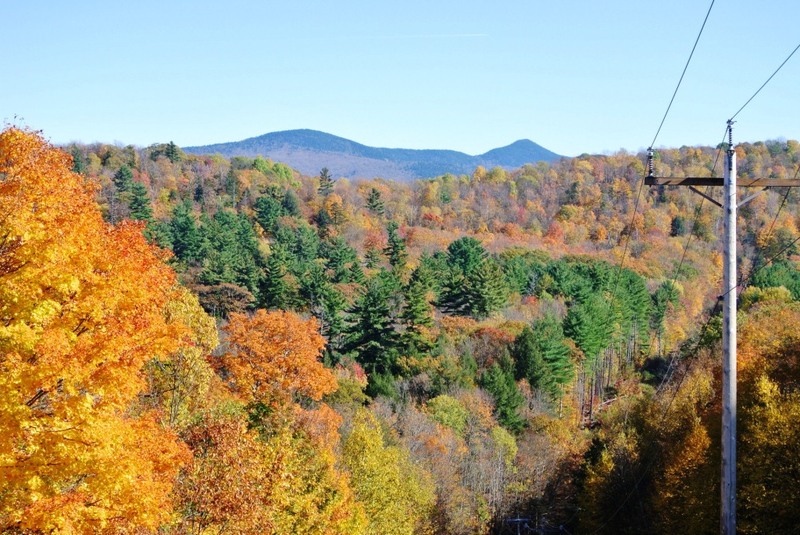 While long delayed this year, the full foliage on the trees in the Middlebury area certainly indicate that the few short weeks we know of as spring are most assuredly here. So a confession here – I did this run a few weeks ago, in mid-May, while the trees were still quite bare, and it has just taken me a while to post it. Nonetheless, it is a good run, so I thought it quite worthy of posting – better late than never! Regular readers by now know that the Silver Lake and its surroundings make up one of my favorite running destinations, and this post represents a new variation on that theme. 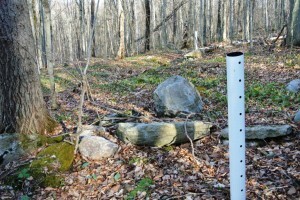 At the core of this run, is the very first post I made to this blog, the ascent from the Sucker Brook Trailhead, past Silver Lake, to the Goshen Trailhead, and back. On this particular run, I chose to extend it beyond this central loop, in the name of checking out some new terrain, as well as visiting an old favorite location for great views. This run, on a warm weekend late afternoon, was undertaken to be one of my last real runs before tapering my training prior to the Vermont City Marathon at the end of May (note – I actually completed the marathon by the time I got to this post – I am not going to write it up for the blog, but it went well! ), so I wanted to stretch it out to the 8-9 mile range. So, I set off up the 4WD road (yes – it is closed to motor vehicles) from the Silver Lake/Sucker Brook Trailhead just south of Branbury State Park, and chugged my way up past Silver Lake up the the trailhead above the lake at the end of a rarely traveled dirt Silver Lake Road, which emanates from Goshen, as a right turn from the Goshen Ripton Road, a mile or so south of the Blueberry Hill Inn. When I reached this road, I realized that it provided an opportunity to add some mileage, so I continued on past the hikers’ parking lot and trailhead, which I knew would descend me back to my parked car, 800+ vertical feet below. So, I continued on this road, which while open to vehicles, is so lightly traveled that it feels almost like a trail. 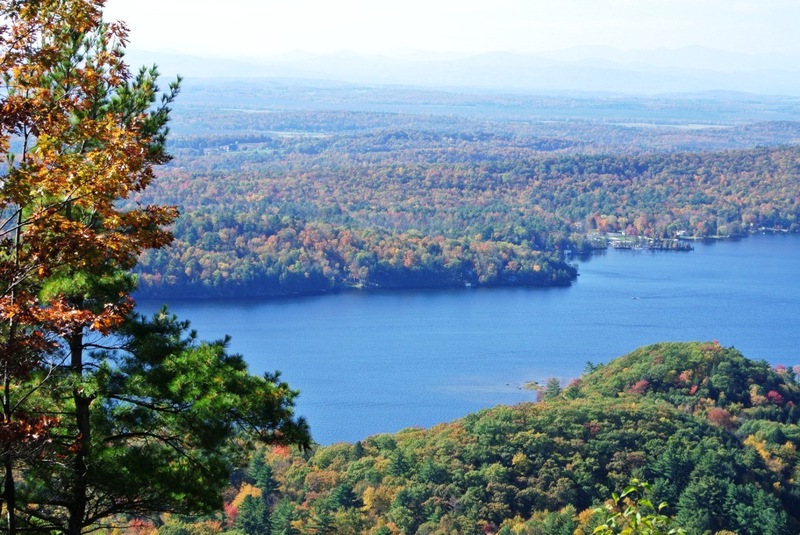 At this time of the year, before any of the trees had leaves, there were great views towards the the main ridge of the Green Mountains, while views towards Silver Lake and the west were obscured by the modest ridge. At a few locations, I noted primitive roads heading up the eastern flanking ridge, but abandoned them when I realized they were driveways up to “off the grid” homes and camps, and I wanted to respect their owners’ privacy. After a little over a mile on this road, I could see Hogback Mountain, and Romance Mountain, the two peaks behind the Blueberry Hill Inn, and thought it would be fun to link to that trail system on this run, but due to the lateness of the afternoon and impending sunset, I decided to turn around at one particularly impressive glacial erratic on my right. 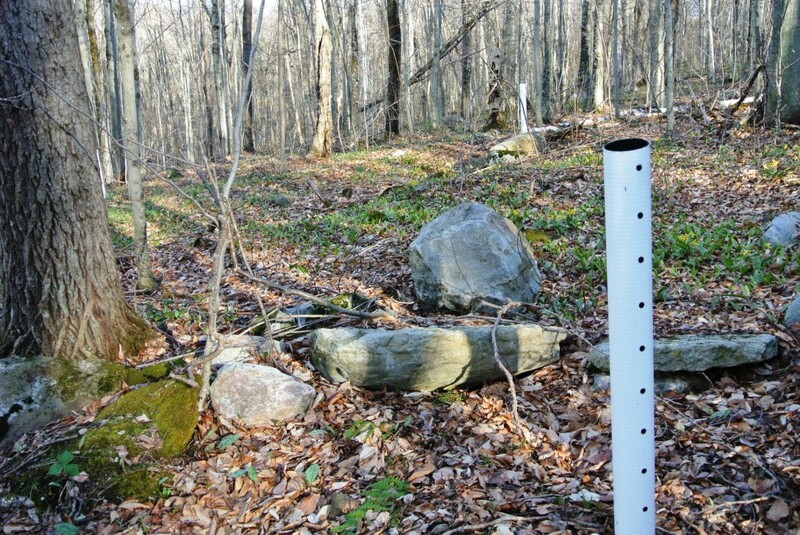 On my return, gazing into the forest for sights which would soon be hidden by the foliage, I noticed a series of PVC pipes stuck in the ground, 20-50 yards from the dirt road. I have come across pipes like this, even further from the road on past explorations. Does anyone know why these are here, or what their purpose is? After contemplating the mystery of the pipes, I continued back to the Silver Lake trailhead, and descended the short trail down to the lakeside on the Leicester Hollow Trail, where I took the right turn back towards the campground and the small beach at the north end of this gem of a lake. Rather than simply follow the trail which I had previously ascended back to my car, I chose one last variation, and instead took the short trail down below the Silver Lake Dam, and followed the penstock (that is the fancy word for “big fat pipe”) back towards the power line, where I ascended its trail to catch the early evening views and impending sunset over Lake Dunmore. In a month or so, the lake will be busy with summer vacationers and boaters, but on this quiet spring evening, there was only one boat traversing what must be an otherwise silent lake. I had hoped that the lone raptor in the skies would land nearby to get his picture taken, or at least hover nearby, but my presence led it to seek out a quieter eyrie. 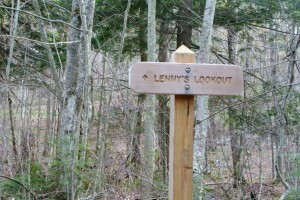 On my descent from this lookout, I took another obvious left turn which returned me to the main trail up from the lower parking lot, where I came across what must be a fairly recently placed sign, where the over look was referred to as “Lenny’s Lookout”. This is the first time that I have heard this name applied, so I am also curious as to the origins of this name. 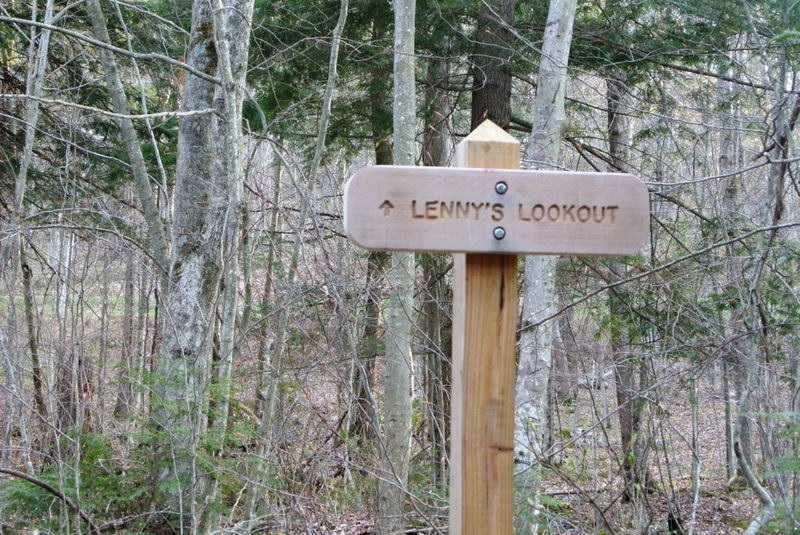 Who exactly is Lenny, and why is the lookout named after him? A google search shed no light on this question, although it did lead to some beautiful photography from another hiker who has posted their pictures of this location. From this point, it was an easy skip down the trail to my car, making this a slightly less than 9 mile run, with about 1100 vertical feet of ascent and descent. Bring on the summer! 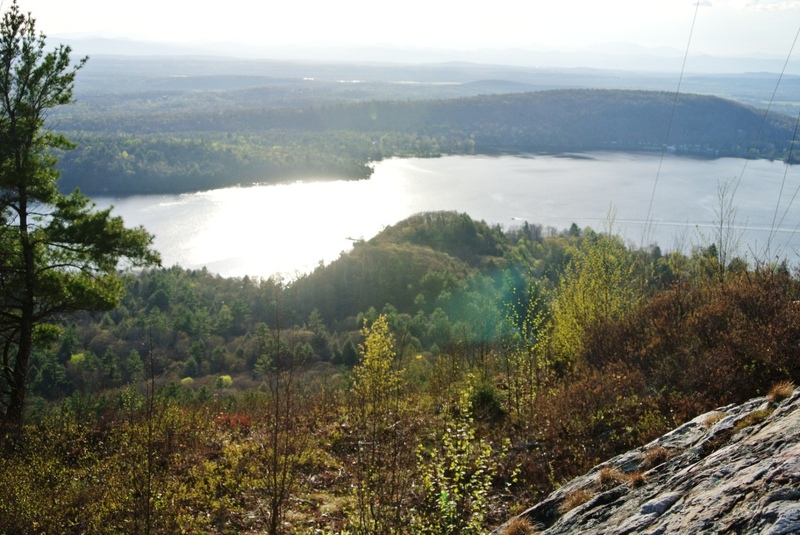 This entry was posted in Midd Blogosphere and tagged Blueberry Hill, Branbury State Park, glacial erratic, Hill Climb, Lake Dunmore, Lenny's Lookout, Running, Silver Lake, Silver Lake Road on May 27, 2014 by Jeff. While it doesn’t seem that long ago that I made my last post, I was kind of surprised when I realized it had been a month and a half. This is always the hardest time of the year to come up with interesting runs, worthy of description on a trail running blog. 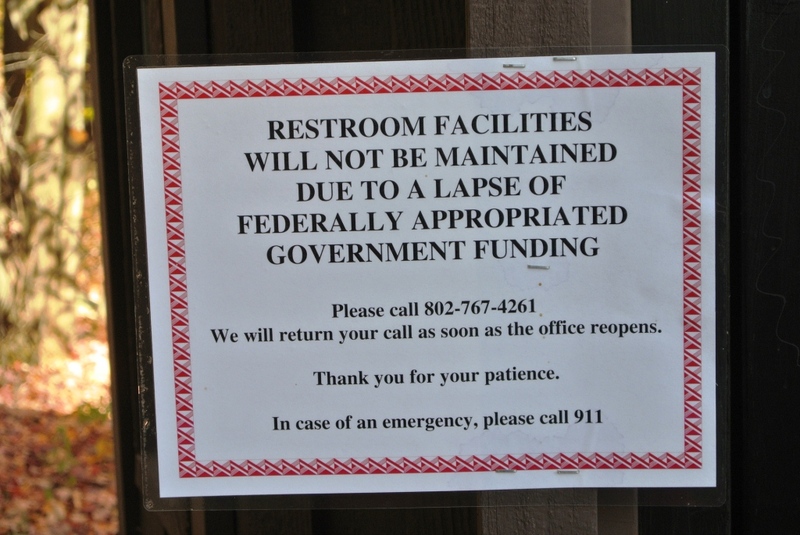 The trails are usually a crusty, icy mess, and the snow has receded to the point where skiing is no longer an option. So, I was forced to the roads (or worse still, to the treadmill), and frankly, I don’t feel any need to bother writing about our intermittently muddy or icy roads in March. After last week’s “Late April Fool” snowstorm, I was beginning to wonder if I would ever get back to the trails! However, a few slightly warmer days, and some Saturday afternoon sun on the day before Easter brought hope of a real spring, and set me out in search of a good long run. While significant mud was a given, I was more concerned that I might find ice and snow at higher altitudes, especially in shady hollows, so I headed to one of my favorite lower altitude starting points, the Falls of Lana trailhead just south of Branbury State Park on the Lake Dunmore Road (Rt 53). Enroute to the trailhead, I was amazed how fast the ice on Lake Dunmore had melted – six weeks ago, the ice was two feet thick, and trucks were driving on the ice, but now, there was not an ice floe to be seen. I started up the steep climb to Silver Lake on the heavily used trail (really a 4WD road) which starts on Rt 53, and even at the lower sections, there were a few icy patches remaining on the trail, but most of the route was open, and not even that muddy. As I neared Silver Lake, I met up with my colleagues Molly and AJ, along with Molly’s kids out for a Sunday afternoon hike, and after exchanging pleasantries, continued up to Silver Lake, reaching it after about a mile and a half. At first glance, Silver Lake also appeared to be free of ice. I headed right over the dam, and followed the lakeside trail for about a half mile, at which point the trail climbing to the Chandler Ridge, the scenic ridge separating Silver Lake from Lake Dunmore, diverged to the right. I did notice, however, that the last sheets of ice were clinging to the shady south shoreline. The Chandler Ridge Trail has been upgraded over the last few years to be rideable by mountain bikers, although it would probably too technical for my riding skills. On the other hand, this level of maintenance is perfect for runners who want to run true “single track” paths, without significant technical challenges to the runner. The climbs and descents are built into gently undulating switchbacks, and the trail designers did a great job of seeking the path of least resistance by weaving its way between the east and west side of the ridge. The leaves which had accumulated since last autumn did briefly obscure the trail in a few places, but every time I stopped and scratch my head, wondering whether or not I was still on the trail, a quick survey of the surroundings quickly made one of the blue blazes marking the trail apparent, and guided me on my way. Early spring is a great time to run this trail, which as hoped, was completely free of snow or ice, as the bare trees allow for views which are superior to those in the summer, when the leaves on the trees obscure most views. I stopped for a moment to take a shot of the southern end of Lake Dunmore, and as I took the shot, I noticed the remains of a charred tree, the which probably bore the brunt of a lightning strike at some time in the not-too-distant past. A short while later along the ridge I had an even bigger treat – literally – a black bear sighting! As I came around one corner, I came face to face (OK this particular bear wasn’t showing me his face, as that was buried in a tree stump, probably rooting around for bugs or other such delectables. As soon as he saw me, he made the right decision and ran away, unlike what happened in my lucky bear sighting last summer, when the bear ran at me instead of away. Of course, this time, with my fortune, the bear ran down the trail, exactly where I was planning to go. So, I gave the bear a decent head start before continuing my route and then continued my run, sporadically breaking out into a very loud and raucous impromptu song which I will simply name “Here I come bear!”. Don’t bother looking for it on Itunes. The rest of the run along the Chandler Ridge was a lovely, steady run through the hardwood forest. I also noticed a decent view to the southeast in the direction of Brandon Gap, a view which I had never noticed previously from this trail. Eventually, the trail ended at a “T” when it hit the much broader Minnie Baker trail, and here I took a right, descending down to Rt.53. Shortly before I reached the road, and when it was in sight, a snowmobile trail veered to the right, and I decided to follow it, in order to extend my time on the trails. Mistake! The run, which had not been too bad by Vermont Mud Season standards up to this point, turned into a total sneaker-sucking quagmire. Fortunately this was a short trail segment, and I quickly joined the road for the much easier last few miles back to my parked car. I did notice, however, that there was an unlooked-for talisman of Sunday’s holiday in the name of a road, which I had never noticed before. Happy Easter everyone! 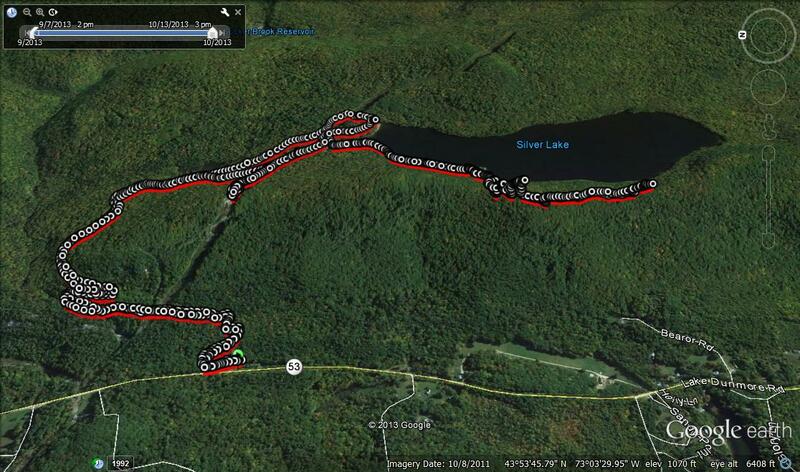 At the completion of my run, my GPS watche showed that this was a slightly over 11 mile run – not bad for early spring! However, when I tried to download the complete track from the run, I was dismayed to find that I had some sort of malfunction, and thus I have no complete track to offer. I have blogged the first half of this run previously, so I can share that this route included a slightly less than 1000 vertical foot climb. 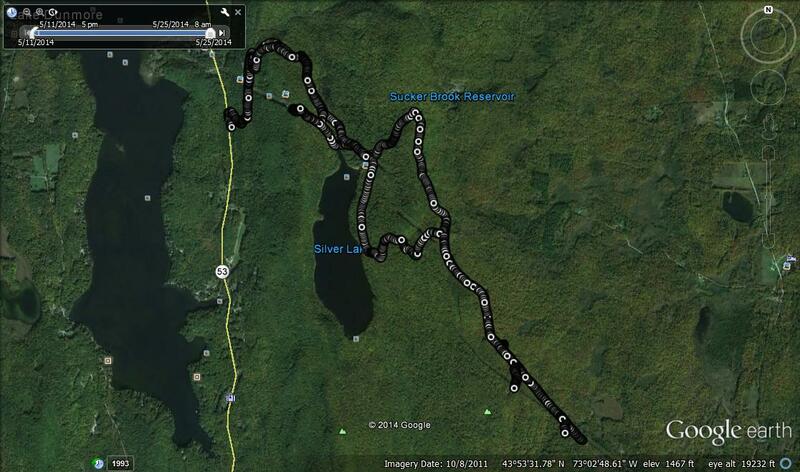 Hopefully, at some point I will have the chance to repeat this route, and will have a GPS track to share. 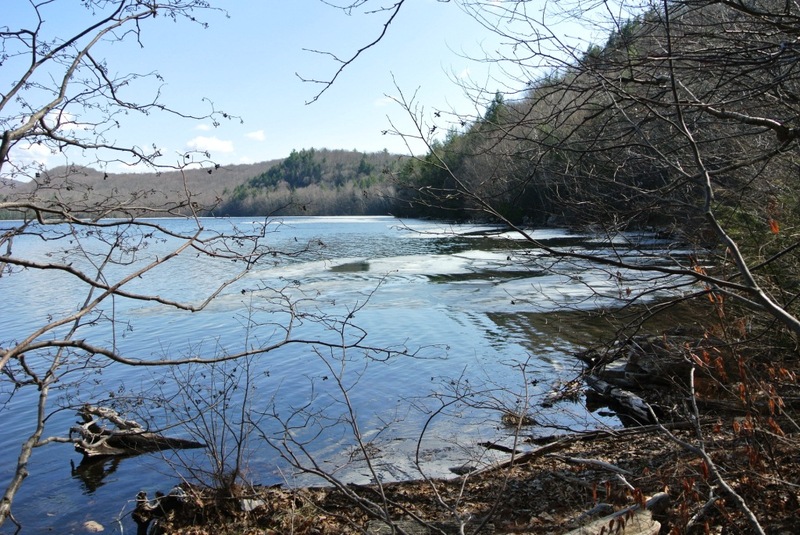 This entry was posted in Midd Blogosphere and tagged bear, Branbury State Park, Chandler Ridge, Hill Climb, Lake Dunmore, Leicester Hollow, mud, Running, Silver Lake on April 22, 2014 by Jeff. While it doesn’t seem that long ago that I made my last post, I was kind of surprised when I realized it had been a month and a half. This is always the hardest time of the year to come up with interesting runs, worthy of description on a trail running blog. The trails are usually a crusty, icy mess, and the snow has receded to the point where skiing is no longer an option. So, I was forced to the roads (or worse still, to the treadmill), and frankly, I don’t feel any need to bother writing about our intermittently muddy or icy roads in March. After last week’s “Late April Fool” snowstorm, I was beginning to wonder if I would ever get back to the trails! However, a few slightly warmer days, and some Saturday afternoon sun on the day before Easter brought hope of a real spring, and set me out in search of a good long run. While significant mud was a given, I was more concerned that I might find ice and snow at higher altitudes, especially in shady hollows, so I headed to one of my favorite lower altitude starting points, the Falls of Lana trailhead just south of Branbury State Park on the Lake Dunmore Road (Rt 53). En route to the trailhead, I was amazed how fast the ice on Lake Dunmore had melted – six weeks ago, the ice was two feet thick, and trucks were driving on the ice, but now, there was not an ice floe to be seen. I started up the steep climb to Silver Lake on the heavily used trail (really a 4WD road, although not open to motor vehicles) which starts on Rt 53, and even at the lower sections, there were a few icy patches remaining on the trail, but most of the route was open, and not even that muddy. As I neared Silver Lake, I met up with my colleagues Molly and AJ, along with Molly’s kids out for a Sunday afternoon hike, and after exchanging pleasantries, continued up to Silver Lake, reaching it after about a mile and a half. At first glance, Silver Lake also appeared to be free of ice. I headed right over the dam, and followed the lakeside trail for about a half mile, at which point the trail climbing to the Chandler Ridge, the scenic ridge separating Silver Lake from Lake Dunmore, diverged to the right. I did notice, however, that the last sheets of ice were clinging to the shady south shoreline of this higher elevation lake. A short while later along the ridge I had an even bigger treat – literally – a black bear sighting! As I came around one corner, I came face to face with a bear. OK this particular bear wasn’t showing me his face, as that was buried in a tree stump, probably rooting around for bugs or other such delectables, so “face to bearbutt” would be a more suitable description of the encounter. As soon as he saw me, he made the right decision and ran away, unlike what happened in my lucky bear sighting last summer, when the bear ran at me instead of away. Of course, this time, with my fortune, the bear ran down the trail, exactly where I was planning to go. So, I gave the bear a decent head start before continuing my route and then continued my run, sporadically breaking out into a very loud and raucous impromptu song which I will simply name “Here I come bear!”. Don’t bother looking for it on Itunes. At the completion of my run, my GPS watch showed that this was a slightly over 11 mile run – not bad for early spring! However, when I tried to download the complete track from the run, I was dismayed to find that I had some sort of malfunction, and thus I have no complete track to offer. I have blogged the first half of this run previously, so I can share that this route included a slightly less than 1000 vertical foot climb. 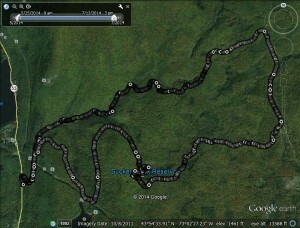 Hopefully, at some point I will have the chance to repeat this route, and will have a GPS track to share. Early March can be a tough season for trail running. The snow is at its deepest on the trails, and runners are getting antsy for the arrival of spring, which is still two months away. Chatting with a fellow runner a few days ago, however, he shared his recent epiphany for good clear running – running on the ice covering local lakes to very thick depths this time of year. He suggested Lake Dunmore, so I thought I would give it a try. One prerequisite for this sort of running is a shoe with spikes, or some sort of runner’s crampon to stay upright moving on a mix of ice and snow, and since I had the former, I figured I was all set. I have not spent much time on open water ice since playing pond hockey as a child. I was a little nervous at first about a longer run on a pretty big lake, but figured that with this year’s very cold winter, good thick ice could be counted on, right? Sharing my running plans with my family, the less adventurous of them (i.e. all of them) double checked to make sure that my will was properly signed, and then acquiesced to my departure. While I spend a lot of time running near, and kayaking on Lake Dunmore over the warmer months, I can’t remember the last time I had journeyed to the lake in the dead of winter. Once, in my young adulthood, I learned the misery of crashing through the ice in water which was not over my head, and a few hundred yards from my lodging. So, my life was never in danger, but it sure was cold! Approaching the parking lot and launch on the west side of the lake, alongside the docks and beach belonging to Waterhouses, I could see that the lake was busy with the activities of ice fishermen. As you might guess, the calm and patience of the avid fisherman are not common characteristics of somewhat hyperactive runners. While I have not fished since I was a boy (about the same time of life that I played pond hockey! ), I can see some of the allure of standing in a Rocky Mountain stream, flyfishing for trout, or perhaps surfcasting from a Gulf Coast beach for – well for whatever kind of fish live in those warmer waters. For the life of me, I cannot begin to imagine the charm and excitement of sitting out in the open, or even a small shack, huddled over a small hole or two in the water on a cold mid-winter day, waiting for the nibble of a lethargic, already half frozen fish. Despite the fact that I have lived in Northern New England now for 33 years of my life, not only have I never undertaken this sort of activity, I really didn’t have a good feel for the popularity of this sport until I saw all of the people out there fishing on Saturday, on this one, rather modest-sized lake alone. To each his/her (mostly his though, from what I see) own. I did get some comfort however, by the presence of such numbers of people, shacks, ATV’s and automobiles out on the lake. If the ice could support someone’s SUV, it could certainly support a scrawny trail runner, right? I set off towards the southern end of the lake to start my run. Since both of the public landings for kayak access on Lake Dunmore were on the northern end of the lake (the aforementioned state landing alongside Waterhouse’s, and Branbury State Park on the east side), I am not as familiar with the waterfront sights along the southern shores, which require longer paddling times to access in the summer. My first destination however, was the small island in the middle of the lake. I have paddled around this small island on countless occasions, but have never actually stepped foot on it prior to this run. In the late spring, this island is a loon nesting site, and two years ago I had the unexpected pleasure of paddling by the island which was surrounded by birdwatchers armed with binoculars. I had lucked out, and come across that year’s loon chick birthday according to one birdwatcher I pulled up alongside. While I stayed a respectful distance away as required by law, even without my binoculars I could see the loon chicks floating in the water alongside their mother. Returning to the island the next day, excited for another glimpse, I was told by another kayaker that the loons typically move from the island to a quieter corner almost as soon as the chicks are born, and I never saw this family again. There were no loons on the island in early March, of course, but I did use the easy access as an opportunity to traverse this small piece of land before heading back on the ice. With my spiked running shoes, most of the footing was surprisingly good. In most of the southern part of the lake which has had little vehicle traffic, the ice was smooth and covered by a half inch to inch of coarse windblown snow, which made for good footing. The occasional wind-scoured bare ice patches required that I slow to a careful walk, and on the places where early season car traffic had created ruts in what have been much softer ice (YIKES when you stop and think about it), the footing was also uneven and unyielding. Continuing south, scooting past mostly well- kept, frequently modern homes which serve as vacation homes for those with greater financial resources than I, I came to one particularly quirky site. 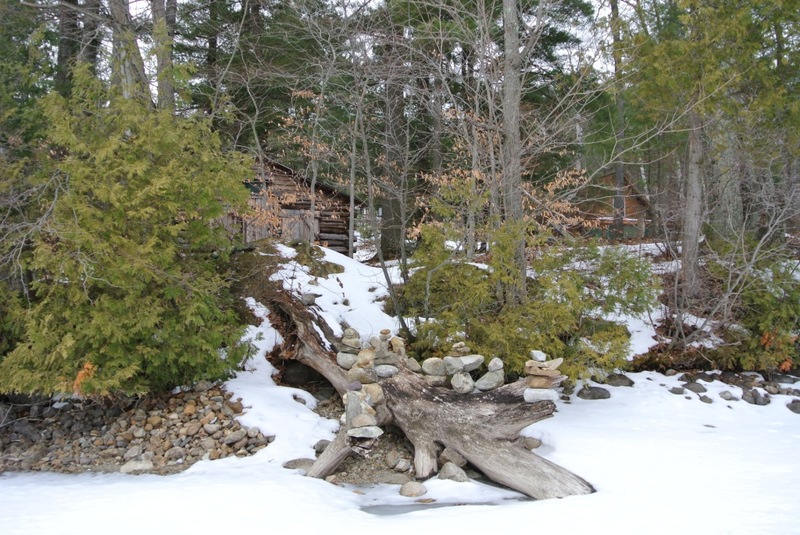 A piece of old driftwood at the lake’s edge was adorned with a variety of funky little stone cairns, and when I stopped to examine them more closely, I could see that the property just set back behind them was an uncharacteristically ramshackle log cabin, which looked like something from my old summer camp, rather than as a lake summer home. At that point I realized where I was – the shoreline alongside the “Point Counterpoint” summer camp. This camp is a rather famous summer camp for talented and hard working young musicians. I had hoped to completely circumnavigate Lake Dunmore on this run, but as I approached the southernmost inlet, I could see that too much of my path was ice, windblown bare, making for difficult footing. So, if you see a portion of the lake omitted from my run on the Google Earth projection down below, that was typically the case. The other major foray away from the shoreline on this run was when I had make a broad sweep away from the delta where the Sucker Brook empties into the lake. This, and the much smaller outlet not far from Waterhouse’s were the only sections of open water that I spied. The lake, of course, was peppered with ice fishing holes, old and new. Most of the open holes in use were being watched by their owners, and I stayed away out of respect for their desire to actually catch fish. Would a runner plodding by create a racket to spook the fish? Somebody must know the answer to that question, but not I! I did come across a few recently abandoned holes, so my curiosity got the better of me and I peered inside. 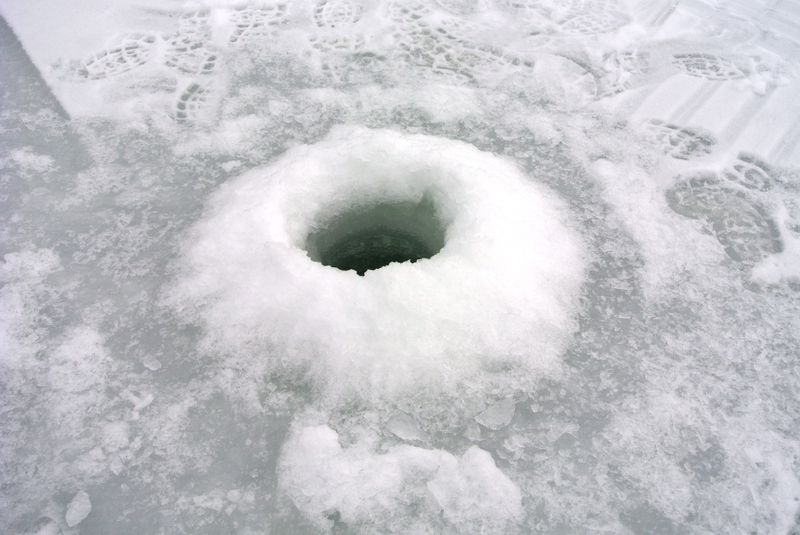 Peering down these holes, I was comforted to see how thick the ice was – well over a foot deep from what I could see. I briefly considered rolling up my sleeves and inserting my arm down a hole, to feel how deep I had to get before feeling the end of the ice, and then my common sense got the better of me. I also took comfort from the fact that these holes were quite narrow, indicating that there were no sharks to fish for in this lake. Returning to my car, a few hundred yards from shore, in a section of the lake with no fisherman shacks, by the old Sunset Lodge, I heard what I had been dreading the whole run – the sound of cracking ice, seemingly directly beneath my feet! Was it time to swim? I quickly put on my garishly ugly yellow hat as I sped out of that corner of the lake, hoping that if I crashed through the ice, my would-be rescuers would see my yellow-hatted head bobbing above the otherwise seamless white of the frozen lake, and pull me to my safety. Needless to say, I made it back to shore, my heart pounding a little, and had the courage to ask a returning fisherman about the significance of my frightening experience a few moments before. “Nah – ice makes sounds like that all the time – it’s more than two feet thick now, you were safe I am sure”. Oh. Whew. Relieved and a bit embarrassed. Overall, this was a 6.6 mile run. It might seem superfluous for me to post my altitude profile for this run, as it was on a lake, and should be….well…flat. I am posting this to illustrate what I already knew about using GPS for altitude. While GPS is incredibly precise for finding locations based on NSEW coordinates, due to the limitations of satellite triangulation, it is not nearly as precise for altitude, as evidenced by the variation of up to 100 feet which it recorded on this run. 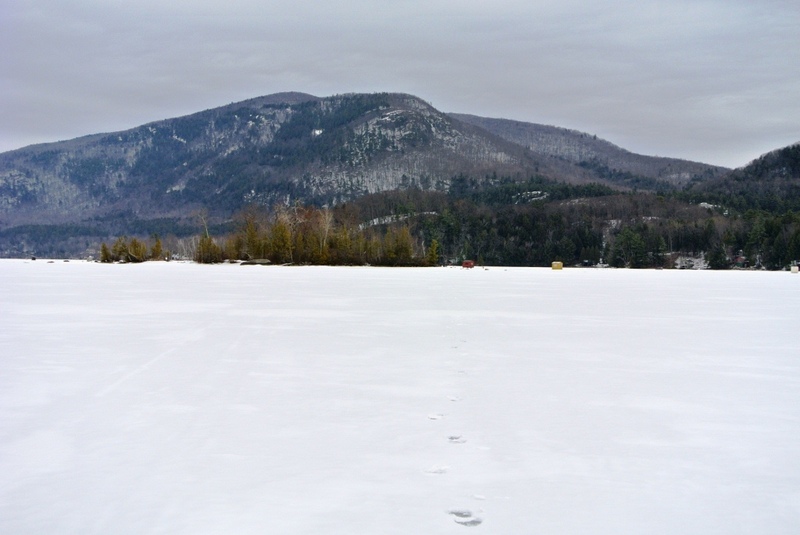 This entry was posted in Midd Blogosphere and tagged Asics Gel Arctic Running Shoes, Branbury State Park, ice fishing, Lake Dunmore, Running on March 8, 2014 by Jeff. 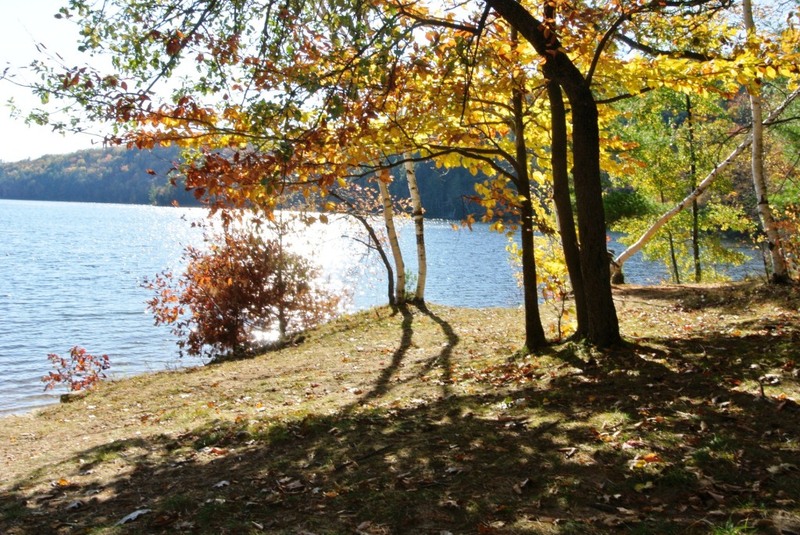 This entry was posted in Midd Blogosphere and tagged Chandler Ridge, Fall Foliage, Hill Climb, Lake Dunmore, Running, Silver Lake on October 16, 2013 by Jeff. Over the last few summers, I have blogged quite a few running routes through the Moosalamoo region, but somehow never managed to work in a run over the region’s eponymous peak, Mt. Moosalamoo itself. So why the sudden urge to actually ascend this rather gentle peak? First of all, I love the way the name rolls off your tongue – is it possible to say the word “Moosalamoo” without smiling? I didn’t think so! 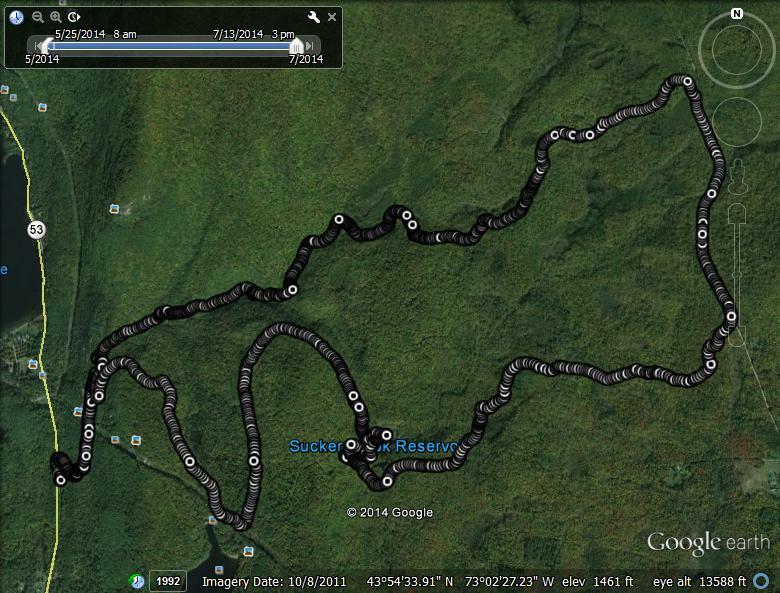 Secondly, looking at the Forest Service map of the area, I realized that I could…so why not? In the course of my hiking, I had climbed Moosalamoo from the Lake Dunmore (west) side – the summit can be easily reached by hiking another mile or two past the popular Rattlesnake Cliffs lookouts. 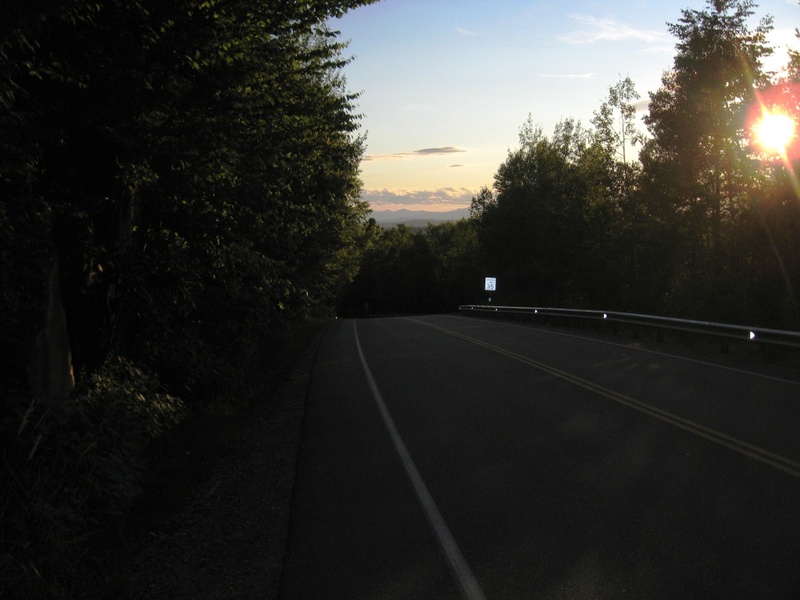 This route takes a different approach, from the East side on the Goshen – Ripton Road. 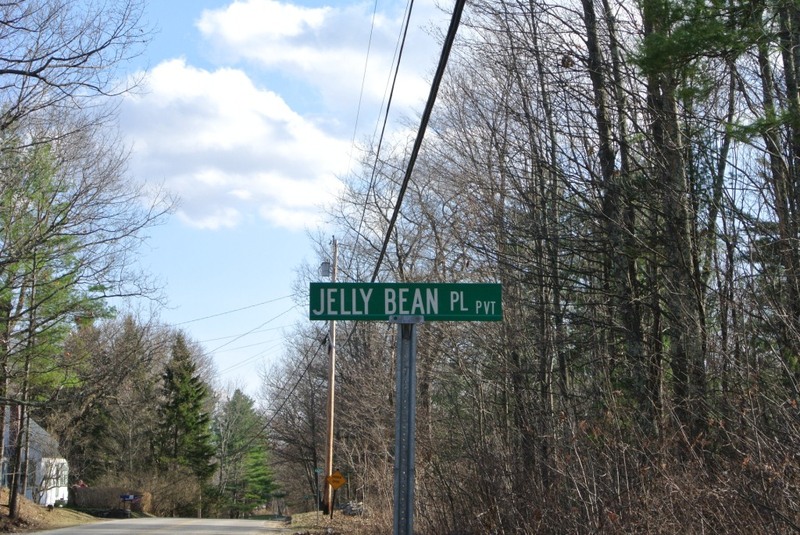 Looking to try a point-to-point run, I had my daughter deposit me at Moosalamoo Campground Road, where it meets the Goshen-Ripton Road at about 5 in the afternoon on a sunny, but not too hot afternoon. After a short time on this dirt road, I took the Mount Moosalamoo Trail heading off to the right immediately before entering the campground area. You will know you are on the right trail, as it is pretty well labeled! This trail zigzags behind the campground for a few minutes, before reaching an old dirt road. At this point, take a right turn for about 50-100 yards before the well marked left turn descending down to a wooden footbridge over a small stream. At this point, the serious climbing begins! The Moosalamoo Trail angles along the northeast flank of Moosalamoo before reaching the Oak Ridge Trail, an easy half mile or so from the summit. 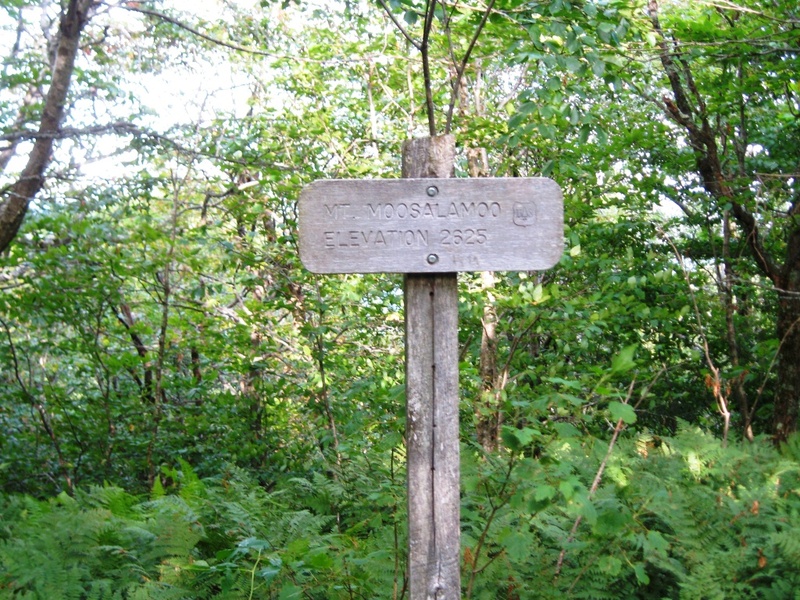 Taking this left turn brought me to the “true summit” of Moosalamoo, which has only limited views through the trees. I knew from previous hikes that the slightly lower, southern summit, has some decent cleared overlooks, but since I had a pretty long run planned in the opposite direction I chose to forego this diversion and save my legs for a lot more miles planned in the opposite direction. It is easy to find the true summit however, as like everything else in this run, it is well labelled! Retracing my steps back to the trail junction, I set off on a very wild stretch of trail, the rarely traveled connection between Moosalamoo and Rt. 125 on the Oak Ridge Trail. 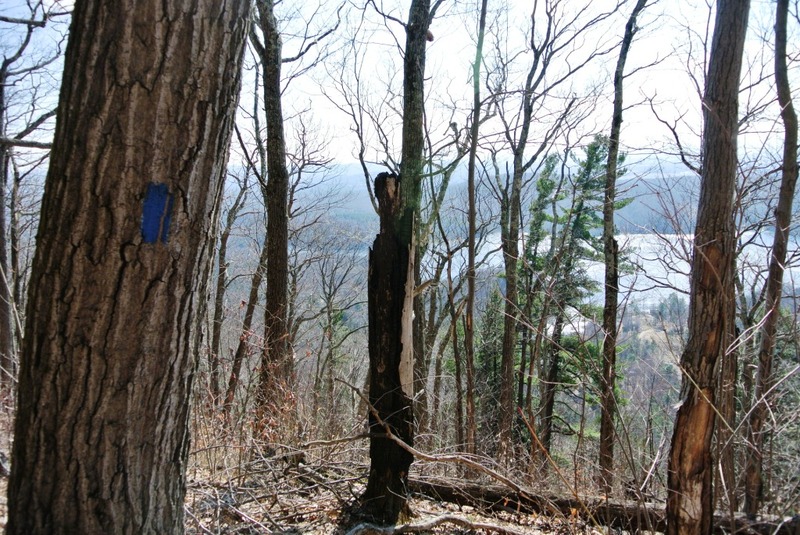 The good news – this trail is well marked (What in the blue blazes! They are everywhere!) and almost entirely downhill. This did make for a very challenging trail however – it is very narrow, and in many places pretty rough going since not many footpads of hikers, let alone trail runners have beaten down this trail. So, while the terrain itself was not particularly severe, the true single track nature of the trail made this slower going than one (that one being me) might expect. I really felt that I was out there, by myself on this one. Passing by a few high altitude puddles which looked like ideal moose wallows, and even noticing some fresh bear poop got me so nervous that every Hyperactive squirrel in the woods made my heart beat faster! Nonetheless, this was a gorgeous stretch of forest. 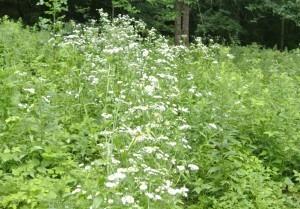 Most of the run was through mature hardwood forest, with the relatively little ground cover. In quite a few sections I felt that there would be excellent views to the north in the fall. I will have to come back and report on this. With the slower than expected pace, and the late start, the forest started to get pretty dark, even though sunset was still some time away. The sun got to be too low in the sky to permeate the forest, leading me to run cautiously, especially at the lower elevations, rather than attempt to shave a few minutes off my time. Somewhat suddenly, after what seemed like an eternity of downhill running, the trail broke out into the diminishing sun, as the narrow single track trail joined the Old Town Road. This “Road” is only used by motorized vehicles for logging operations at present, and has never borne vehicular traffic in my 25 years in Addison County, but its level of development and the fact that the power lines leading up to Ripton following this route seem to indicate that it was once a real road. Does anybody know anything about the past use of this road? Did it always run parallel to Rt 125, or did Rt 125 supplant it at some point? Finally, reaching this broad easy former road did allow me to stretch my legs out a little and really run, however, without worrying about tripping over stumps and rocks, and it brought me after about a mile and a half of easy descending to Rt 125, where I caught the now setting sun, before descending into East Middlebury, ending the run at the playground parking lot on Schoolhouse Hill Road. This long and challenging run ended up at about 11 miles in length, with 1000 feet of climbing, and 2000 feet of descent, most of it at a slow jogging pace. 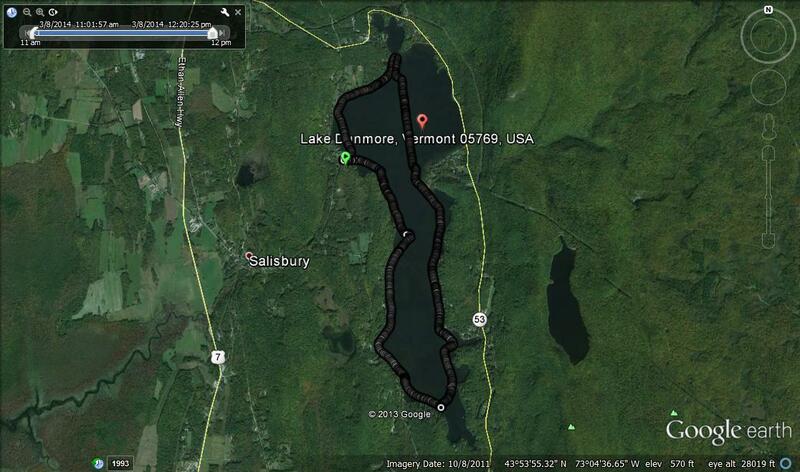 This entry was posted in Midd Blogosphere and tagged Hill Climb, Lake Dunmore, Moosalamoo, Oak Ridge Trail, Running on July 30, 2012 by Jeff.